Anyone interested in the subject of bushcraft soon realises that the trail of knowledge originates with our earliest ancestors in the stone age. Many of the skills we now use to journey through the countryside, hills and mountains can be attributed to bushcraft. From the quick weather check before departure, to an awareness of the nature we see along the way and the camp craft we use as the sun sets. Although today we might use the terms hill skills or mountain craft, all in one way or another are an extension of bushcraft techniques that have developed through the ages of time. Oxygen isotope analysis shows that the bronze age Amesbury Archer, who's grave near Stonehenge was dated to 2300BC, originated in the alpine region of what is now France. In those times his journey to Britain would have taken months, if not years. We will never know whether he was making a pilgrimage to the stones, seeking a cure for his diseased knee cap. Or, he may have been the bearer of secret knowledge regarding the metallurgy of making bronze from tin and copper. Whatever the reason, the journeying (or bushcraft) skills he used along the way would have been of everyday second nature to him. In Britain there are the faintest smudges of evidence remaining from the Mesolithic, or middle stone age. Charred hazlenuts, carbon dated to a time just after the last ice age and flint worked into arrow heads and hand axes, give us the briefest glimpses into a way of life that still tenuously exists in just a few places on earth: The Hazda in East Africa, for example. By comparison, the new stone age, or Neolithic, represents a seismic change, a revolution in human culture which has left us magnificent megalithic constructions of stone circles and tombs in the landscape. I am fascinated by this period of change. How did the hunters react to the new stone age farmers? In some places it may have been a peaceable process of integration, exchange of meat for useful items like pottery for instance. Whilst in others there might have been extreme violence. The hunters shocked, distraught and angered at the destruction of the wild forest. The hunters surely viewed themselves as being part of the wild forest that covered much of Britain at that time. By contrast the ways of the farmers, felling the trees and tilling the land for crops were ultimately incompatible. In the tombs and monuments that the Neolithic farmers created there remained a strong reverence for nature and ancestor worship, but this became ritualised with increasing complexity and statements of construction, in what might be seen as a prototype of religion at the beginnings of human society. I have traveled from the northern Isles to the most southerly Islands of Britain in a quest to further understand this incredible period of change. From this will emerge three films. The first is "A journey through Neolithic Orkney", which was published in two parts on You Tube earlier this year. The second is "The neolithic revolution in ancient Guernsey" which I have just completed and released. 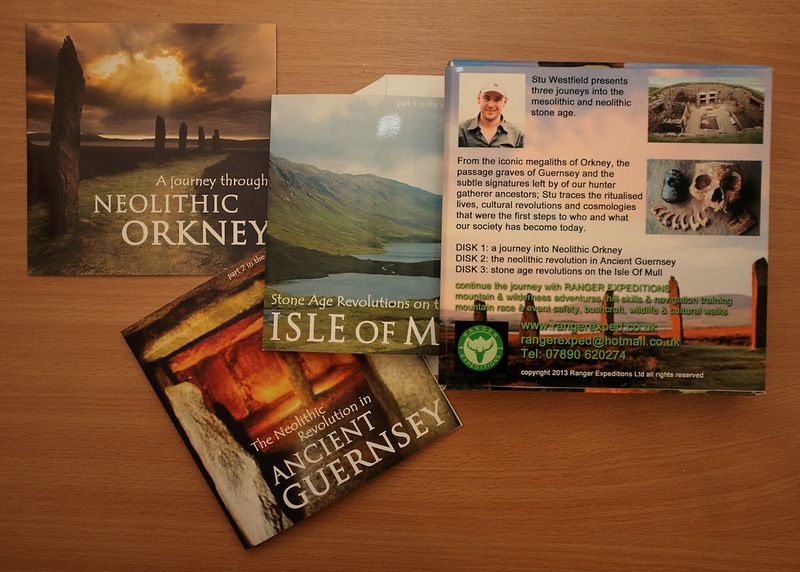 The final part is set on the island of Mull and through a investigative process pieces together clues from geology and living nature to show an environment where Mesolithic hunter gatherers would have thrived. And a neolithic culture of cosmology which continued into the bronze age. 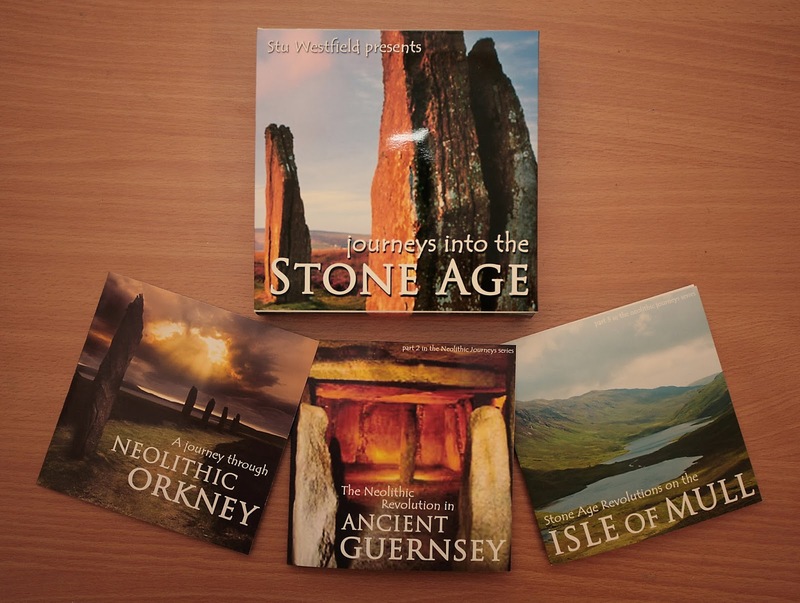 Just for fun, we even made up a box set....(not available in shops, but all the films and more can be seen at the Ranger Expeditions channel on You Tube).